Create a thank you card on our invitation option or create a invitation on our thank you card option, you have the freedom to choose. 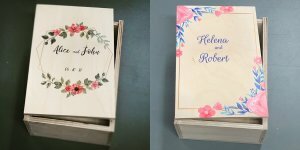 Thank you cards are individually printed single sided on genuine photographic paper. Each card is 100x150mm (6x4 inches/Jumbo size) available in Landscape (horizontal) or Portrait (vertical) formats.